More than a mall. Destination retail across the globe. As retail continues to evolve, traditional shopping venues morph into experiential destinations. See how this global shift takes shape in Dubai as ZenGenius Guru, Leslie R., explores the city. With retail booming over the last decade, it’s no surprise that Dubai is an international tourist destination for shopaholics. As traditional malls and brick-and-mortar stores close their doors and rethink their approach here in the United States, that’s not the case for Dubai and the rest of the U.A.E. Anchor stores are no longer the only reason to visit as shopping malls become an experiential destination for all. On a recent trip to Dubai I discovered, and experienced, that visiting the mall isn’t just about walking out with purchases in hand. Whether you are observing sea creatures through the aquarium glass or zip lining on the world’s longest and fastest zip line, Souqs, Dubai Marina Mall, the downtown Dubai Mall and the Mall of the Emirates, guarantee a full day of excitement. Why drive to the mall when you can fly? Super women always arrive in style. Taking full advantage of my day (and being an adrenaline junkie), I took the plunge and channeled my inner Super Woman at the Dubai Marina zip line. After a short and seamless registration process, I was briefed on my adventure ahead. I hopped on the bus and headed toward a looming tower where I was safely fastened into a harness to take flight. Upon the platform, I was lifted into the air and spread my wings. Soaring through the sky I took in the sights of the city, landing safely on the other side of the marina. This was by far the most exhilarating way I’ve ever traveled to the mall. Safety first! Getting ready for take-off. Spreading my wings as I cross the marina. Did I mention that you can go skiing? Yes. Ski slopes - in the desert. Not just in the desert, but inside a shopping mall. During my week-long stay I had multiple options for shopper-tainment like this one. Besides aquariums, zip lines and ski slopes, there were opportunities to bowl, play video games, catch a movie at the outdoor cinema and gather with family and friends. You can even lace up your skates at the indoor ice rink where you can explore a shoebox pop-up by Adidas. Check out this massive adidas Ultraboost shoebox at the Dubai Mall placed upon their indoor ice rink. As evening approached, I wandered toward a majestic fountain for a show combining lights, music and water theatrics that rivals those of the iconic Bellagio Fountains in Las Vegas. Visitors can also stop at the Atrium to star gaze and view constellations. For those looking to experience an ultimate high, grab tickets to the Burj Khalifa, the world’s tallest building offering 360 degree views and conveniently attached to the Dubai Mall. Decor and gifts and groceries, oh my! In the following days I continued to seek-out new adventures. 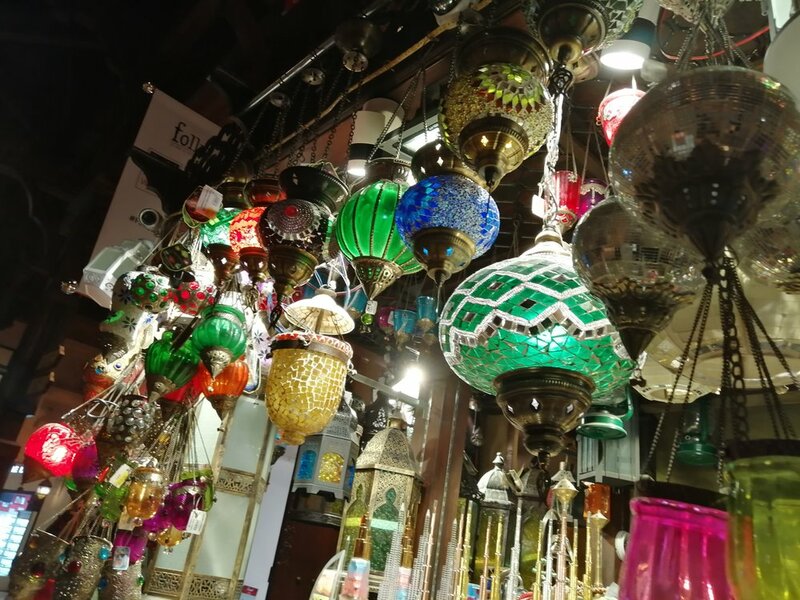 Walking the souqs I explored traditional Arabian treasures, finding trinkets, gold, textiles, lamps, tea sets and more. It is the perfect place to find a little something to bring home and remember Dubai. Let’s talk groceries. Yes, I said groceries. Even the most routine task of stopping by the supermarket has been elevated and integrated into the mall experience. 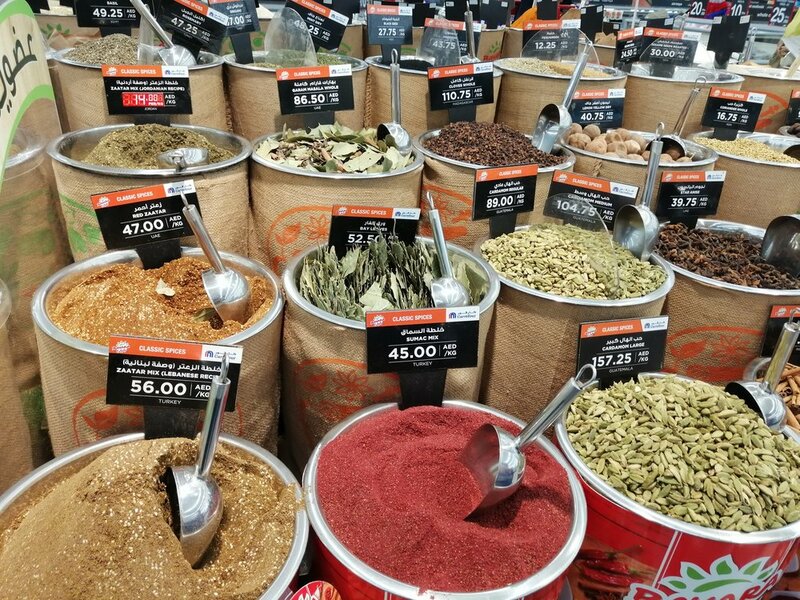 Dubai has eliminated the extra stop in your commute home by merging traditional grocery stores and hypermarkets like Carrefour, into their format. Before leaving the mall, you can stop in and grab everything you need for your evening meal. Offering everything from produce, meat and seafood and other dry goods from around the world, everything is beautifully organized and their country of origin is easily identified. So be sure to pick up a kilo of black olives from Lebanon, your strings beans from Oman, herbs from Madagascar and mangos from India! Check out highlights from my recent trip to Dubai as I scoped out the latest in retail shopping experiences. What’s next for destination retail across the globe? Dubai is working on a design for the world’s next tallest building in addition to the current one towering the city. On top of that, plans of the world’s largest mall are also in the making. I’ll be excited to see what they come up with next. How does the United States rival Dubai in destination retail? Despite recent news of brands collapsing and store closings, things are happening. With a retail revolution in the works, relevant brands continue to evolve bringing new products and consumer experiences to market. Check out some of the latest retail destination developments here in the U.S. below. Creative designer, Leslie Ritchey comes from a diverse and worldly background. Over the last eight years of her career, she has gained tremendous experience working internationally as a creative designer, marketing specialist, and business development professional within the U.S and Middle East. Create a unique retail destination with elevated visual presentation and in-store experiences all your own with the experts at ZenGenius.